Former Nelson print journalist brings two decades of media experience and community outreach in the Kootenay/Boundary to Selkirk College. Selkirk College welcomed a new member to its communications team this week. Bob Hall has spent two decades as a Nelson journalist and joins the college in the position of Community Liaison/Alumni Coordinator. Bob Hall came over to Selkirk College from the Nelson Star where he was editor of the community newspaper. 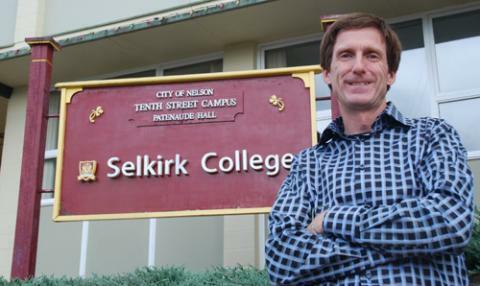 "We're so thrilled to have Bob join Selkirk College,” says Selkirk College President Angus Graeme. “Our success is defined by how effective we are at inspiring and engaging students and communities with our vision of post-secondary education in the West Kootenay/Boundary. Bob's skills, extensive experience and knowledge of this beautiful region will be an immediate asset to an effective community relations, development and engagement team." Hall will be tasked with helping the college communicate with current and prospective students. He will work with community leaders and alumni in continuing to build relationships that keep the college strong. Hall arrived to Selkirk College from the Nelson Star where he was editor of the twice-weekly community newspaper since 2010. Prior to that he spent 15 years with the Nelson Daily News where he started as a reporter and finished as the newspaper’s last editor. Learn more about Selkirk College or find us on Facebook.